On Tuesday when I heard Jagex was hosting a preview of two of their upcoming titles in San Francisco I was giddy. It wasn’t often you heard about a new title from the company still known for the classic RuneScape and I knew that they wouldn’t put their name behind anything that wasn’t incredibly off the mainstream beat while still having fun factor through the roof. Then they threw a curveball at me – Facebook Racing Game. Both Facebook and Racing haven’t exactly been buzz words synonymous with fun and quality in the western online gaming market. But the next line of the invite followed with “Midnight Club Series dev team” and “Unity Engine.” I was back on board! So how is this done? First off the Unity Engine isn’t your grandma’s browser engine. We’re talking the same technology behind such unbelievable upcoming browser titles as the territory war pvp title, Game of Thrones, and persistent pirate fighter, Kartuga. This means that you will be actively facing up to 7 of your friends or equally skilled and leveled auto queue rivals in a real time race to the death. Sound pretty intense for Facebook yet? They at least provide a serene environment to help you relax in between missile explosions. The entire game takes place on a tropical island paradise, with tracks broken up via warp portals to make each race unique despite the locations being roughly the same. Of course it’s a pretty big island with scenic beach fronts, jungle, and an active volcano as you will find out on one track that circles the entire perimeter, resulting in an average 5-6 minute race. Though that might be a bit long for casual gamers trying to sneak some quick action in between glares from their boss so 13 total tracks are available ranging from a minute and a half to the massive race I mentioned prior. Those playing at home seeking more enduring races can find just that in the multilap races. Customization is always a selling point in any racing title and Jagex knew well enough to not only offer the typical car performance upgrades (50 in total) and visual customization among 5 base vehicle options, but also weapon upgrades in the form of rpg style skill trees. Jagex races play out similar to the Mario Kart series with blue orbs scattered around the track providing extra firepower to decimate your enemies. As you race you’ll be able to specialize your weaponry to meet your style between 5 different weapons and 47 total upgrade options. So on to the most important question, how does it handle? Carnage Racing is far more forgiving than most driving games I’ve played both on console and PC. The game is designed around the philosophy that skill should give you an advantage but everyone should be able to compete and the first step towards reaching this is offering extremely easy to pick up controls. You steer with A and D, go forward with W, and reorient yourself after being blown to bits with S as reverse. F handles all your weapon activation needs and space bar… well space bar is a world unto its own. See when you fly off the edge of a jump and press buttons like mad to perform spins and flips, or when you blow someone up with missiles or leave a fire trail that burns up your rival’s tires, you gain booster points. Throughout the track are a series of blue spiral stones that at first glance you might mistake for arrows pointing the way to the finish line. Not the case. These are warp portals you can activate by pressing space bar to use up your warp power, rocketing you into short cuts and ahead of the competition, while also offering an excellent escape route from impending attacks. Every time you take damage your boost meter will decrease and you can only hold 3 charges at a time so there’s plenty of tactics as to when and why you use them. One particularly hilarious use is to time an opponent using the weapon that warps them to you, and then swerve into a warp stone to watch their car smash against the rock you just drove through. But being a Facebook game Jagex thought ahead and included time trial modes and time trial challenges for those with different time zones and schedules that still want to compete with each other. Each track has a bronze, silver, and gold time for you to challenge to try to improve your skills. Once you’re practiced up you can send out a 24 hour invitational to all your friends. Then each of your friends can accept and try to turn in their best time on the track while racing your ghost. I’ll admit it’s not as exciting as the missile filled mayhem of the live mode but it really costs the game nothing to include this, so props to them for going the extra mile. 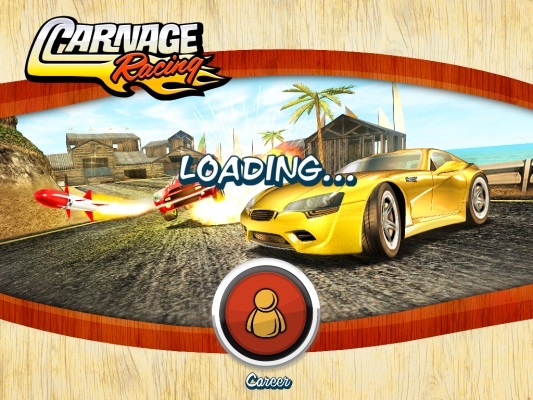 Carnage Racing really is the beginning of a new world of browser games that are going to blur the realm between client-based titles and instant play titles. As Jay said during the meeting, (paraprahsed) “The stigma of Facebook games is really starting to fade away. It’s merely a social medium capable of hosting anything you can do in a browser game so why not partner with it to create an easier matchmaking experience for our players?“ The devs did a fantastic job with the artificial rubberbanding via portals and items to ensure that everyone stays in the race within around a 20 second stretch of each other, even on the longer tracks. Out of the 8 races we played I only saw around 3 DNF (did not finish) which occurs if first finishes around 25 seconds before the player does so that gives you an idea of how close and competitive each race can be. I recommend any racing fan to take a few minutes today to slack on their job and get into the driver’s seat of Carnage Racing. My office’s Firewall doesn’t block browser games so I certainly will be doing the same!